"Have you heard of International Rescue? "; "Sure, but no one knows who runs the outfit. Where do they come from?" When people are in danger of disaster proportions, they know they can count on International Rescue to send their Thunderbirds rescue vehicles to the disaster site and save the day. This was the idea of Gerry Anderson who created the original Thunderbirds TV show in the 1960s. 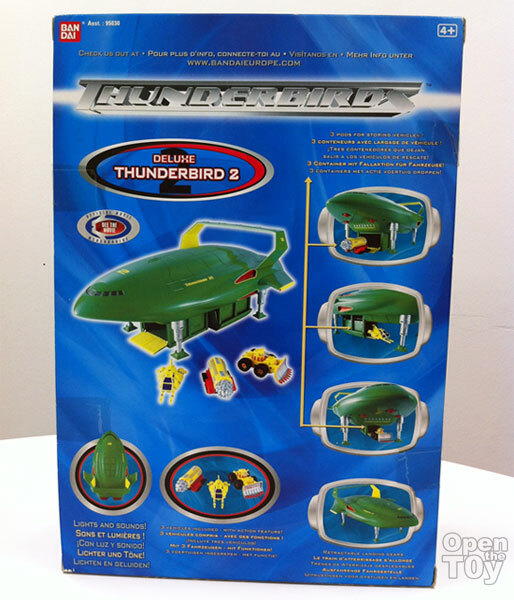 This is the Deluxe Thunderbird 2 toy based on the “Thunderbirds” movie released in 2004. The toy is 11 inches long is size and comes with all three rescue vehicles featured in the same movie. The toy also comes with lights and sounds effects. The Thunderbird 2 is International Rescue’s heavy transport aircraft. Its function is to send smaller rescue vehicles directly to the disaster site. The toy is nicely packed in a bubble plastic glued onto the cardboard. 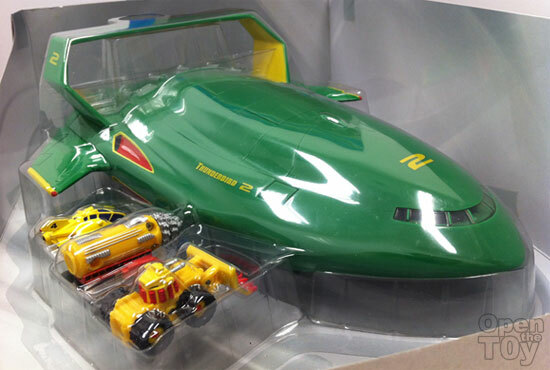 The Thunderbird 2 toy is painted in gloss green, yellow and red and modeled just like the same rescue vehicle featured in the 2004 movie. 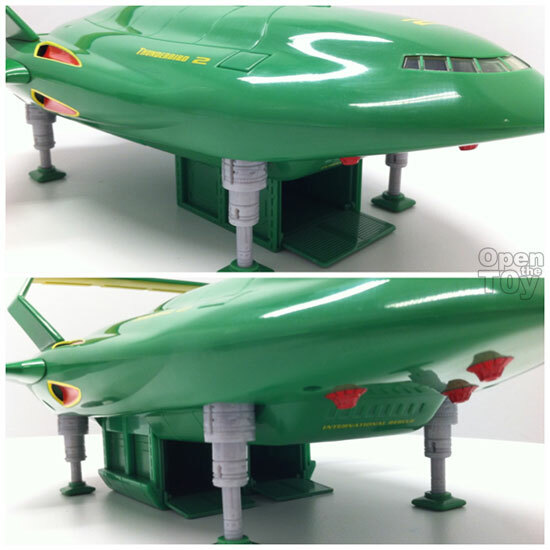 You can use the provided bubble to prop the Thunderbird 2 in flight mode or extend the “legs” to stand the aircraft in landing mode. The highlight of Thunderbird 2 has to be the unloading of the rescue vehicles via the pods it carries. This toy allows you to release the respective three pods as seen in the movie. 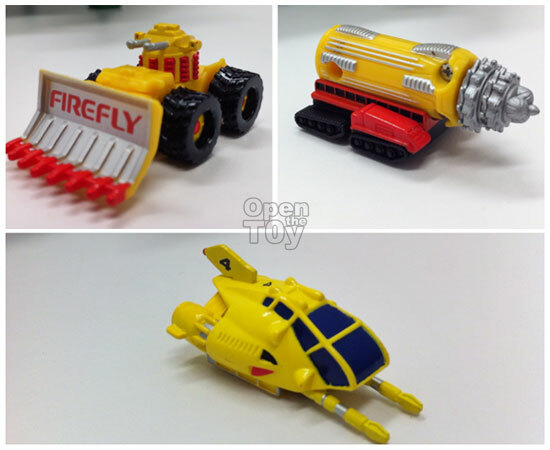 This Thunderbird 2 toy is carries all three rescue vehicles (clockwise from top left), Mole, Firefly and Thunderbird 4. 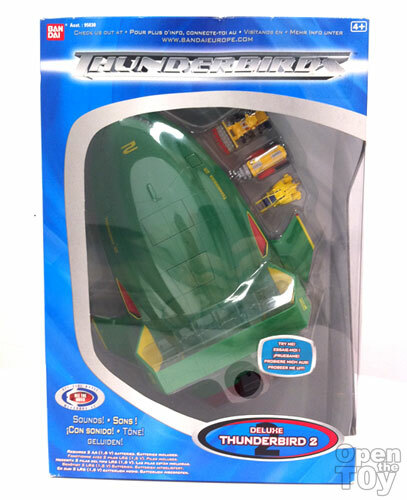 Last but not least, the Deluxe Thunderbird 2 can built-in lights and sounds effects. You operate the lights and sounds by pressing the rectangular button nearest to the rear lights. 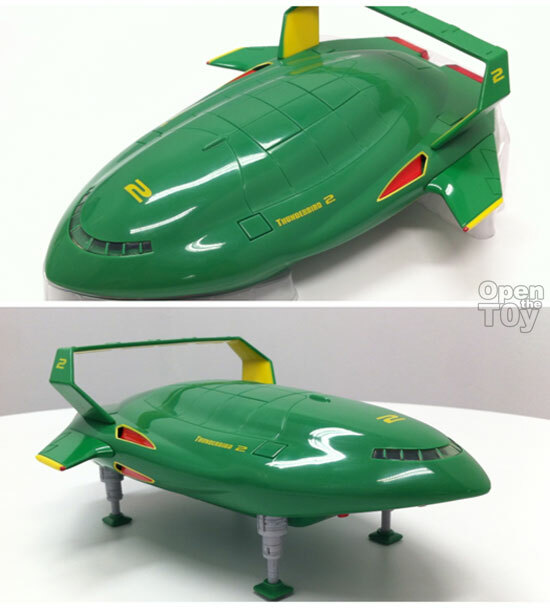 I think the Deluxe Thunderbird 2 toy by Bandai Europe is beautifully made. Although the 2004 “Thunderbirds” movie is much hated by critics, this 11 inch size toy is a joy to handle and looks impressive on its own. 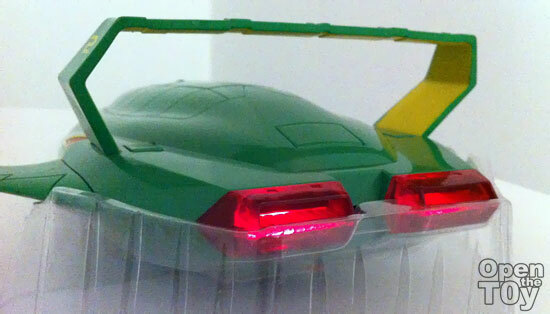 All the buttons I needed to operate the toy are cleverly designed on the Thunderbird 2 body itself. The supplementary rescue vehicles, Firefly, Mole and Thunderbird 4 included in this set are nicely painted and they make Thunderbird 2 complete. Thank you Yeetat for your personal review of this collection.